The patient is a 76 year old male with a history of prosate adenocarcinoma treated with radiation therapy ten years ago. He now presents with a tumor at the prostatic urethra and bladder neck which is extending into the bladder. 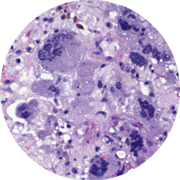 Histologically, the tumor consists of highly pleomorphic cells with frequent multinucleation, bizarre shapes and mitotic figures within a myxoid stroma. 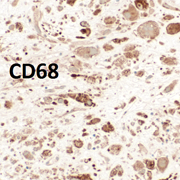 There is abundant tumor necrosis. 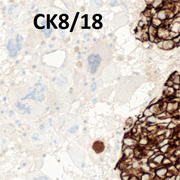 Immunohistochemical stains for keratin (pan CK and CK 8/18) highlight the residual benign urothelium and are negative in the tumor cells. 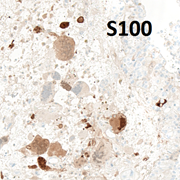 The tumor cells stain positive with vimentin, smooth muscle actin, CD68, and S100. The PSA stain is negative. 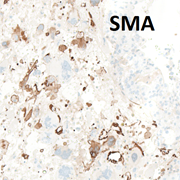 In light of the history of radiation therapy, this tumor could represent a post radiation sarcoma.